® Global Wholesale D I S T R I B U T O R Some parts are not legal for use in California or other states with similar laws/regulations. Please check your state and/or local laws/regulations. Typographical errors and errors in description or photography are subject to correction. ©2015 AUTOSALES, INC. 1200 Southeast Avenue • Tallmadge, Ohio 44278 • Fax: 1.330.630.5365 • Password Security • Real-Time Inventory • Free Site Access • 24/7 Order Processing AtechMotorsports.com 800.517.1040 1.330.630.0888 SOURCE CODE: WHSE15PB Open an Atech Motorsports Dealer Account Today! 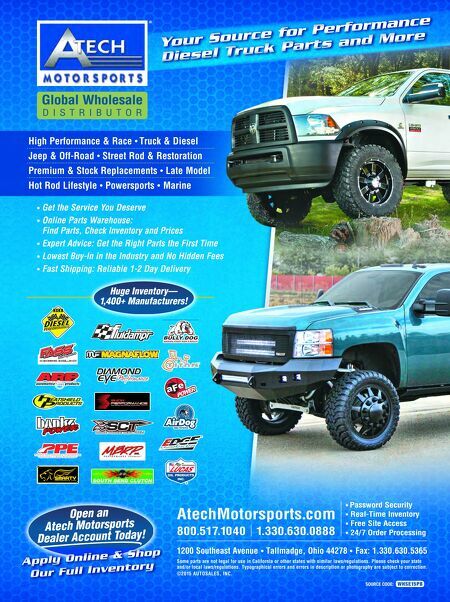 Apply Online & Shop Our Full Inventory • Get the Service You Deserve • Online Parts Warehouse: Find Parts, Check Inventory and Prices • Expert Advice: Get the Right Parts the First Time • Lowest Buy-In in the Industry and No Hidden Fees • Fast Shipping: Reliable 1-2 Day Delivery Your Source for Performance Diesel Truck Parts and More High Performance & Race • Truck & Diesel Jeep & Off-Road • Street Rod & Restoration Premium & Stock Replacements • Late Model Hot Rod Lifestyle • Powersports • Marine Huge Inventory— 1,400 + Manufacturers!